Not sure which class to do? Follow this calendar and Just Do Yoga! I have hand selected classes for you so that you don’t have to think about which class to take. Think of it as a yoga cleanse for your body and soul! Some days are longer days of yoga, and some are shorter. The plan?? Just Do Yoga! You can always add on an ab session or a stretch session. This calendar is meant to keep you on track, keep you doing yoga daily: no matter if it’s 15 minutes or 45 minutes. Download, print, follow and track yourself through the month! Discover new classes and join me on the mat to just do yoga! You will notice we have some repeat classes throughout the month: yes, that’s intentional. When you do a class once that’s great; when you do a class 3 times or more, you start improving, advancing, and mastering certain aspects of the class. Copy the calendar, Post it in a place where you will look at it and Just Do Yoga! Thank yourself for showing up on the mat every day! Begin Your Yoga Journey with Me! 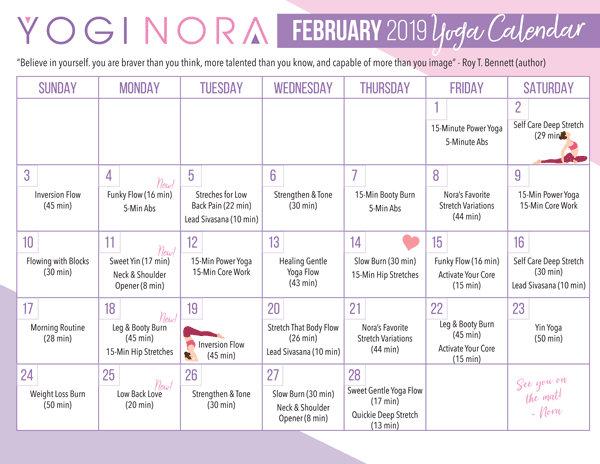 Start your 7-Day FREE Trial and have instant access to all Yogi Nora Classes!